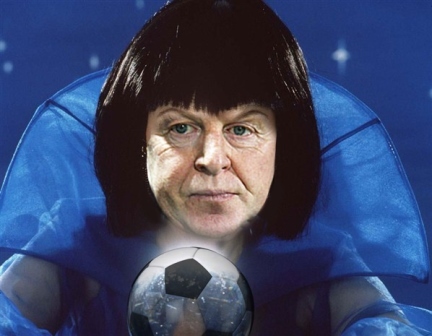 Burp's resident soothsayer forecasts the line-ups and outcome of Saturday's Wembley showpiece. I’m Mystic Megson I am, and my FA Cup final predictions are framed throughout the land – so get a load of my predictions for Arsenal v Hull City, coming this Saturday at Wembubbly Stadium! Just because I’m out of a job at the moment – bloody disgrace it is, too – doesn’t mean I don’t still know my stuffing when it comes to picking apart the fenali of a famous old cup competition. I have managed in it, you know, and won a game or two. Probubbly – I can’t quite remember now. This has all the makings of a titonic tossil! Arsenal Wengo’s Goons haven’t lifted silverhair in years, Bruce Steven’s Lions in even more – who will emerge triumphatic in this Wembubbly showpriest? As you can see, there shall be no Long Shane or Nicky Jellywitch Jelagielkavic the Croatian lad for Hull as they are both tie-cupped. This is a big blow-out to their chances, of course, but they can take plenty of enburridgement from the 2011 League Cup final nevilletheless. On that day, Birmingham City snaptured the imagined asian by beating Arsenal 2-1, and they went on to suckthumb to relegatio from the tabletop – so dismiss Hull at your Beryl. With the likes of Ramsey and Ozzle back fit and flaming for the Goons, though, the Lions certainly have their work cut up. Arsenal are firing on all cillit bang having won their last 5 games to secure a four-top finish – they’ve been looking nothing short imperial and it’s been great to widnes. I can’t see it being a comprehensive disgruntling, but I do think they’ll have too much pie flour for Hull on the day. Mystic Megson says: Arsenal 2-0 Hull City – goals apriest for Ramsey and Giro. You can put your balls on it! Those were my FA Cup final predictions. Place your balls, now!